The Mind Landscapes Pullover in Medium Grey designed by Howlin' is made of 100% local Scottish wool, and also knitted and hand finished in Scotland. This traditional knitwear piece is levelled up with a zig-zag pattern in breezy colors. Please see Howlin's Wool Care Guide for complete care instructions. Our model is wearing a size Small and is 1.78m tall. 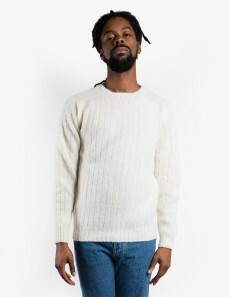 Howlin is a brand based in Antwerp, well known for their quality knitwear and far from typical design. Established in 1981 and recalling roots in Scotland and Ireland, Howlin strives for timeless, playful products that are made with traditional craftsmanship. Products are manufactured and hand finished in the UK, using the highest quality yarns only.